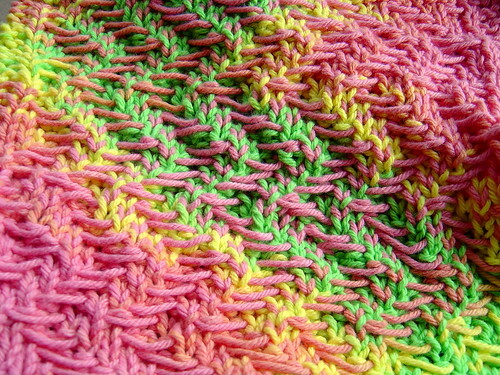 I knit this pattern with Peaches & Creme Pink Lemonade. Row 1: K2, P1, *P2, K3, repeat from * to the last three stitches, P1, K2. Row 2: K3, *yif, sl 3, yib, K2, repeat from * to the last three stitches, K3. Row 3: K2, *P2, K3, repeat from * to the last four stitches, P2, K2. Row 4: K4, *yif, sl 3, yib, K2, repeat from * to the last two stitches, K2. Row 5: K2, P1, *K3, P2, repeat from * to the last eight stitches, K3, P3, K2. Row 6: K5, yif, sl 3, yib, *K2, yif, sl 3, yib, repeat from * to the last three stitches, K3. Row 7: K2, P1, K2, *P2, K3, repeat from * to the last six stitches, P2, K1, P1, K2. Row 8: K3, yif, sl 1, yib, K2, *yif, sl 3, yib, K2, repeat from * to the last 5 stitches, yif, sl 2, yib, K3. Row 9: K2, P1, K1, *P2, K3, repeat from * to the last seven stitches, P2, K2, P1, K2. Row 10: K3, yif, sl 2, yib, K2, *yif, sl 3, yib, K2, repeat from * to the last four stitches, yif, sl 1, yib, K3. Row 11: K2, P1, K2, *P2, K3, repeat from * to the last six stitches, P2, K1, P1, K2. Row 12: K3, yif, sl 1, yib, K2, *yif, sl 3, yib, K2, repeat from * to the last 5 stitches, yif, sl 2, yib, K3. Row 13: K2, P1, *K3, P2, repeat from * to the last eight stitches, K3, P3, K2. Row 14: K5, yif, sl 3, yib, *K2, yif, sl 3, yib, repeat from * to the last three stitches, K3. Row 15: K2, *P2, K3, repeat from * to the last four stitches, P2, K2. Row 16: K4, *yif, sl 3, yib, K2, repeat from * to the last two stitches, K2. Repeat Rows 1 – 16 three more times. 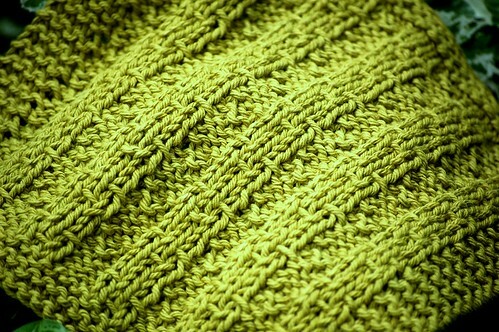 Knit 3 – 4 rows. 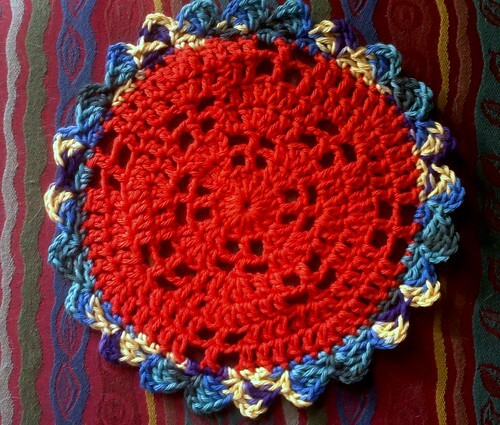 Designed by solmama January 2008. I finally got around to posting this! 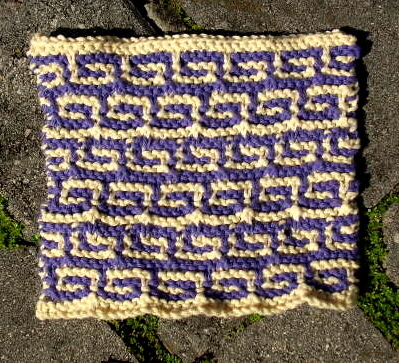 Inspired by a stitch found in Pam Dawson’s Illustrated Guide to Knitting. Knit by my one of a kind test knitter and editor Mimi You can check her out on ravelry as skullsnbats. 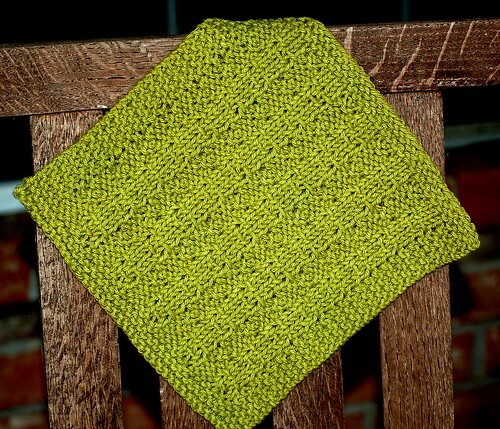 Any worsted weight 100% cotton yarn in 2 colors. 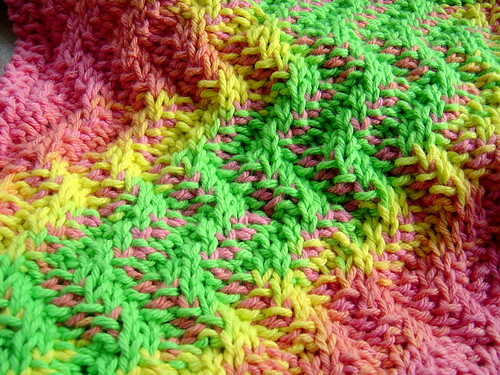 Mimi knit this pattern with Sugar & Cream MC cream and CC grape. Slip the stitches on the right side rows with yarn in back. 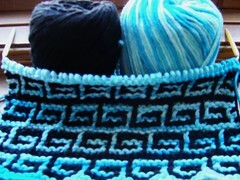 Slip the stitches on the wrong side rows with yarn in front. Cast On 38 stitches with MC or # of stitches divisible by 6sts plus 2. Using MC, Row 5: K 2, *sl 1, K 3, sl 1, K 1, repeat from * to the end of the row. Repeat Rows 1-20 twice more. 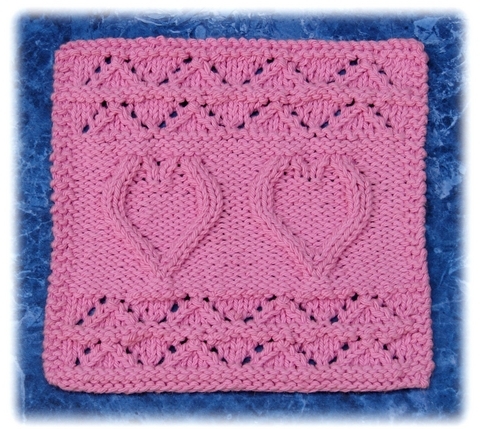 Inspired by Pam Dawson’s Illustrated Guide to Knitting and the drop stitch in a Chris Burgess Pattern. Knit by my amazing test knitter Dawn You can check her out on ravelry as 2mayboys. 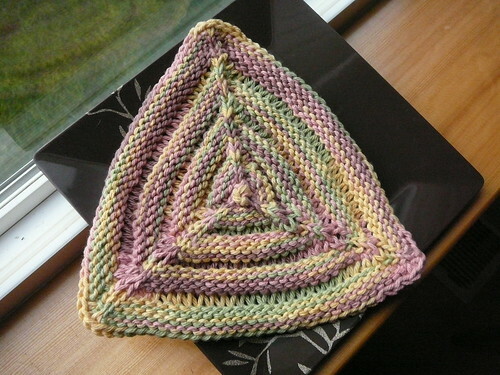 Dawn knit this pattern using Sugar & Cream Fruit Cake. KW2 = Knit one stitch wrapping the working yarn around the needle twice. When switching to the circular needle place a marker after the last stitch from each dpn, with a special marker in place to mark the beginning of the round. Cast On 6 stitches placing 2 sts on each of the 3 needles. Join and ktbl of each stitch to form the foundation row.